Surprise! The twins can get out of their cribs. Hi there and welcome to the 152nd episode of the Dad’s Guide to Twins Podcast. This is Joe Rawlinson. As always you can find me on the web at TwinDadPodcast.com where you will find a transcript for this podcast and our previous podcast episodes. 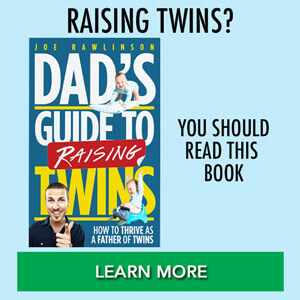 Today’s show is brought to you by my second book for fathers of twins it’s called “Dads Guide to Raising Twins: How to Thrive as a Father of Twins” that covers from newborns to infants to toddlers and beyond. You can learn more about that book at RaisingTwinsBook.com. 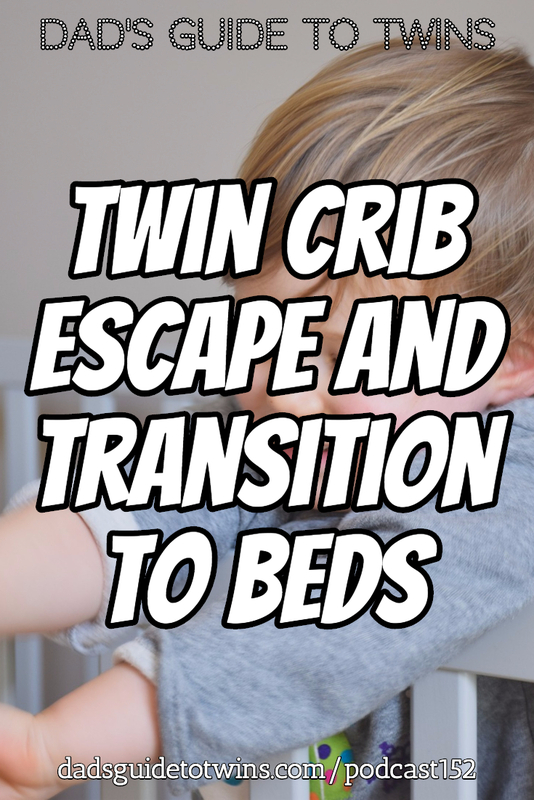 Today I like to share our story of the transition that we had to make from cribs to big beds for our twin girls how we accidentally stumbled on that transition and how we can learn to the process of what was going to work for us. It was a Sunday evening that my wife and I had put down all the kids for bed: our two older boys and the twin girls. We were just sitting in the family room talking when all of a sudden I heard a thump pitter patter pitter patter patter, creak opens the door and out walks one of our girls into the family room I looked at my wife and my wife looked at me I stood up and I walked her back to her crib. I put her in the crib and I closed the door and as soon as I had shut the door and took a step into the hallway again and I heard thunk pitter patter pitter patter door knob turning and the door creaks open again and there stands one of my girls. HUGE smile on her face thinks this is the funnest game that she has ever played. Now this was a moment that I was not ready to handle that evening. And as I looked into the room I saw her twin sister in her crib who was starting to lift her leg up upon the rail of the crib trying to mimic what she had just seen her sister do. So naturally my wife and I went into panic mode to figure out what to do with our girls who now had learned how to escape from the cribs. We thought well it’s not safe for them to be in their cribs if they can just climb out. They’re going to hit their head or do something or do something bad. So we need to move them immediately to a floor where it’s safer for them to sleep. So we went into the rooms we took out the mattresses from the cribs we put them on the floor and we tucked them in and say congratulations you’re a big girls now you get to sleep on big big girl beds on the floor. Now we turn off the light in the room and as soon as we left the room the girls jump up and run around over over to the door open the door and are both laughing and smiling and looking at us. So we thought oh no this is not going to work at all. We need a way to make this adjustment. And I don’t know if it’s going to happen tonight. So what we did was we took I took a sheet and put it over the crib of each of our girls. Now our girls thought this was amazing because it was their own little fort that they can sleep in. Now to us it was great because it prevented them from climbing out of the crib at the top. What this did was it bought us the one night that we needed for my wife and I to plan how we were going to tackle this the next day. So the next day when our girls woke up we got them excited. Today girls is the day that you’re moving to bigger beds just like your brothers are in big bed you get to go from cribs to big beds. And we took them to the store and they helped us pick out sheets for their mattresses. They helped us take down the cribs and get everything set up and organized in their bedroom because now they’re big girls and they get bigger beds. So the entire day was anticipation and building up tonight when they would get to sleep in their big girl beds. The evening came and we went through the bedtime routine and then we got our girls tucked into bed and we turned off the lights and we shut the door and as soon as we shut the door, then it’s party time. It’s like a sorority. Our girls are jumping on the beds screaming running around. They go into their drawers of clothes and they throw out every single piece of clothes that they have on the floor. My wife and I realized we had forgotten to remove the distractions that would deter them from sleeping and going to sleep. Each time we went to the room we would calm the girls down and we would try to remove of the distractions. The first time we went in we put the clothes back in the drawers said you need to stay on your beds. And then we shut the door and left and again and they jumped out of bed. Party time. All the clothes on the floor. The clothes stayed on the floor the rest of the night. The next time we got the girls settled and we leave the room then they start flipping the light switch on and off on off on off on off. You can see it you know under the door. And so I go in there into the room with my little step stool to reach up I unscrew each of the light bulbs in the light so now you’re not going to turn a light on or off any more. We get them settled in bed. I leave the room a few moments later I hear cries coming from their bedroom. I rushed into the bedroom to see what what is the matter. And I noticed that the nightlight that they had had is out. So the room is completely dark. So one of my girls is crying because the room is completely dark and the other girl who is holding the nightlight is crying because surprise a night light is hot. OK. So we took the night light and we put it behind the dresser where they couldn’t reach it and got them settled back into bed and had to repeat this multiple times. That first night it too several hours to get our girls to bed and finally fell asleep. You know several hours after their bedtime that evening. But when we found that over the next several nights as we were consistent in helping our girls get back on their beds keep their heads on their pillows keeping their eyes closed. That each night the party took less and less time and the amount of destruction in the room was less and less each night until eventually we put our girls down to bed. We talked to him in his second night and they fell asleep. So this was a huge milestone for us and our ability to adapt quickly and transform to the needs of our girls really helped us this week. Usually as parents you get comfortable in a routine in a schedule and then all of a sudden your kids hit some kind of milestone and everything gets thrown out the window and you have to think fast on your feet and adapt to the situation when your kids start to crawl out climb out jump out of their cribs is one of these milestones that can really wreak havoc on your expectations of a day. But remember that if you set expectations with your children, if you remove those distractions that can deter them from falling asleep, and if you are consistent every night with what you’re doing and what you’re encouraging them to do that they will eventually get into the habit of falling asleep and not throwing a party every night like our girls did initially. So if your twins are on the verge of moving from a crib to a big bed maybe around age 2, which is about when this happened to us, try to remember some of these concepts and principles that we’ve talked about today. If you’re consistent even though that may take days or weeks your twins will really learn what is needed for them to fall asleep on their beds and not in their grips and is definitely hopeful to kind of audit your children’s room to make sure that distractions are removed so that all they really have to focus on when they go to sleep is falling asleep. If you’ve already made the transition from cribs to bed I would love to hear how it went for you with your twins head on over to TwinDadPodcast.com and you can leave a comment on this episode and share your story with your fellow twin parents. And if you are in the throes of crazy toddler twins or infant twins and getting ready for the next couple of years ahead I invite you to pick up my book “Dads Guide to Raising Twins: How to Thrive as a Father of Twins” which will walk you through newborns to infants to toddlers and beyond including tips and tricks on the transition from cribs to beds. You can learn more about that book and get your own copy at RaisingTwinsBook.com. Thank you so much for listening today. I really appreciate it. And I’ll see you next time.